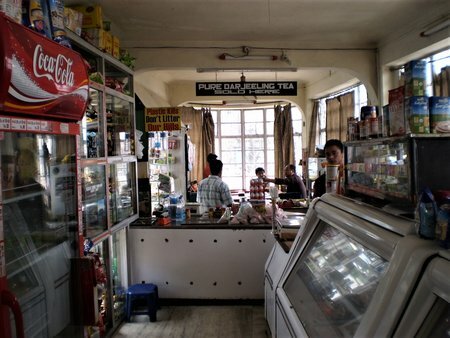 Those who know Darjeeling and keep coming back, to them Keventer's has always been a dear eatery. Having completed 100 years since it's establishment in the British Colonial days, Keventer's has made its own name in serving some of the best English breakfast, tea and snacks in this hill town. If you relish a sumptuous breakfast, or afternoon tea with snacks, then don't miss out on Keventer's. It's located on Nehru Road that leads to the Chowrasta Mall and among a busy shopping area. The ground floor is the take away section and the bakery. Climb the narrow wooden stairs for the upper floor. There are only five small tables in the indoor area upstairs that can seat four each. With wooden floor, glass top tables with checked tables cloths and cane chairs with cushions the ambience is relaxed and casual. As you walk into the upper floor, from the window-side tables on the right you get marvelous view of the mountain range and the scenery. You can spend hours there sipping a cup of tea and reading a book. From the tables on the other side of the small room you can see the Planters Club and the Nehru Road below. The tables are spread apart and have nice elbow rooms. On one side is a counter where the waiters arrange the dishes before they serve. However, the highlight of the seating in the upper floor is at the lovely open terrace. You get great views all around and can even watch the activities down below on the busy streets. 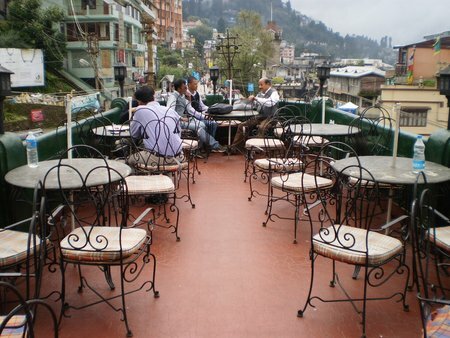 There are several round tables and wrought iron chairs that are laid out in the terrace. The tables have marble tops. They also put up giant umbrellas here during the winter or if its drizzling. With dark green low walls, red stoned floor, Victorian lamps on the pillars along the wall and unabated views, it's a wonderful experience to spend some time here as you have your breakfast. Meat loaf & eggs (this is my favorite here and comes with triangular soft chicken pieces with fried eggs), sausages, salami, chicken cutlet, meat balls, lollipops etc. Chinese and cocktail sausages fried, Frank Furter fried, salami fried, bacon & eggs, meat balls, ham salami & eggs fried etc. With chicken, pork and cheese fillings, salami toasted sandwiches, hot dogs, meat loaf sandwiches, ham and bacon burgers. There are vegetarian preparations as well including cheese sandwiches & burgers, baked beans on toast etc. During breakfast, you will also get toast, butter and eggs made to order. For beverages, there are a number of choices including Darjeeling tea which is served on a pot with brownish ceramic cups, coffee in a pot (hot or cold), chocolate shakes, hot chocolate, hot or cold milk. Try out the unique rose shake. You will of course get standard cold drinks & colas, ice creams, mineral water, sodas, juices etc. TIP: The portions in Keventer's are quite large. If you are taking a full English breakfast, you will possibly need to skip your lunch. I do not personally like the sausages here. They are fried, quite oily and taste a little bland. But they too come in good quantities. The meat loaf is really nice. I never miss out on a breakfast at the Keventer's whenever I visit Darjeeling. Since decades I had been seeing two waiters Mann Bahadur and Dawa Lama who are serving here. They are now my good friends. Maan Bahadur is working in Keventer's for over 50 years and Dawa for over 30 years. 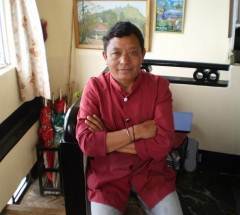 Their wonderful smiling faces are ideal to start a perfect day in Darjeeling. 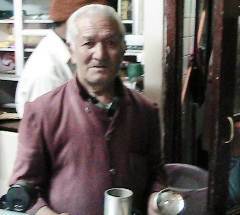 Update 2012 October: Mann Bahadur, the oldest serving waiter at Keventer's has passed away in September 2012. The bakery and the take away section is at the lower floor. 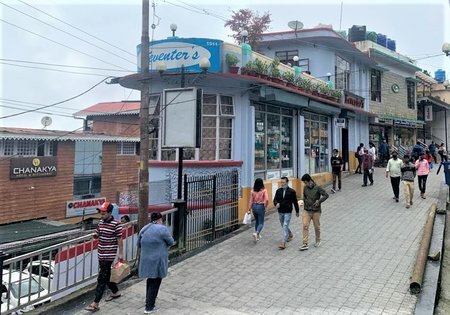 There are varieties of items that are sold here including sausages, ice creams, potato wafers, bread & loafs, chocolates, Darjeeling tea in packets, biscuits & cookies etc. The current owner Mr. Jha sits here at the counter. Note that an additional 13.5% VAT (value added tax) is charged on all food items. Keventer's serves breakfast and snacks. They accept credit cards. Keventer's is located right at the beginning of Nehru Road that leads to the Chowrasta Mall. The entrance is from the busy road that has shops and stalls on both sides. 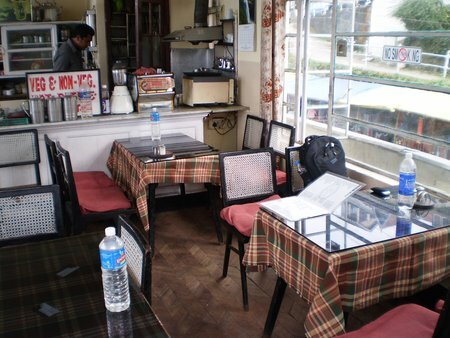 Address: Keventer's, 1 Nehru Road, Darjeeling, India.